A medium nib is the choice of 80% of customers as it suits most handwriting styles, available for immediate delivery. Fine and Broad to special order allow 14 days for delivery. Sheaffer Lifetime Guarantee. Brushed Chrome with gold accents. 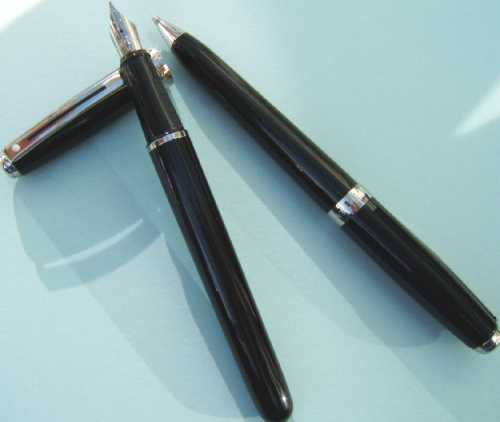 Fountain pen comes complete with converter and spare in cartridges. This pen comes with a medium nib as standard, if you require an alternative nib choice click here. Mr Pen stocks bottled ink in 50 colours. Fountain pen comes complete with convertor and spare in cartridges. Remember to order your refills from Mr Pen, we only stock the genuine consumables. Click "More Product Information" on bottom right for image of beechwood box.